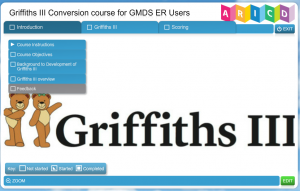 This is an on-line course for Registered GMDS-ER User who would like to become a Registered Griffiths III User. The course has 3 parts: Introduction, Griffiths III, and Scoring. Each section is followed by an Assessment so you must complete all three parts. If you are not sure if you are registered or not, please contact courses@aricd.ac.uk. To book the Conversion e-module, complete the Booking Form below and click BOOK NOW. You will be able to take the course from any computer, any day(s), and at the time(s) of your choosing. The course will take from 3-6 hours to complete, but this does not have to be done in one sitting. You can stop and resume the course as many times as you like, but it is recommended that you set aside at least an hour of uninterrupted time at a time. You will be able to print a Certificate of Completion for your records immediately after you successfully complete the e-module. 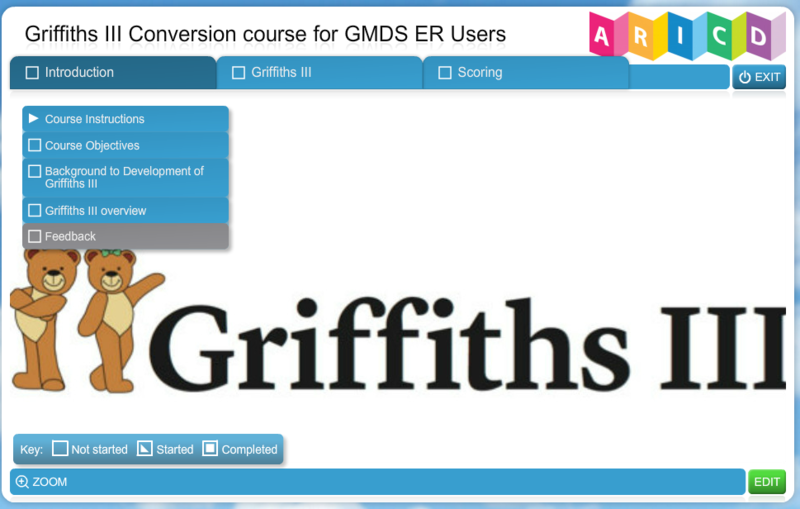 Within a few weeks, ARICD will then e-mail you a Griffiths III Registration Certificate with your Registration Number. The Conversion Course should be completed within 6 months of enrolling in the course. You will continue to have access to the e-module after completion to review the topics. From 1 July 2019, you will need to be a Registered Griffiths III User in order to purchase the Griffiths III kit from Hogrefe. Please register your interest by booking the course. Ensure that you have completed the GMDS-ER Course details in your Account Profile. Once we have confirmed your GMDS-ER Registration status your booking will be confirmed. This will be followed within a few days by an e-mail from elearning.aricd.ac.uk informing you that you have been enrolled in the course, with a link to the e-module. Then you can start your course. Access to the Administration Manual and the Griffiths III kit whilst taking this course is highly recommended (but not mandatory) in order to gain maximum benefit from this course. If you are signed up for a Face-to-Face Conversion Course, please try to book well in advance so that you will be able to complete the module in time. If you are not on the Registration list, the process may take much longer and you may need to produce your original certificate or proof of Registration payment. if you would like to attend a face to face conversion course, these can be arranged in your locality if you are in a position to organise a venue and co-ordinate those attending and ARICD can help arrange a Tutor to run the course. Please contact courses@aricd.ac.uk if you require further information about this possibility. Date: Any day or time of your choosing. Your booking must first be confirmed by ARICD and e-learning site must have sent you a link in order for your email login to be recognised by the e-learning site.